I have been sewing since my legs were long enough to reach the pedal of the sewing machine. I learned to knit, crochet, embroider, macramé and bead-weave as a young child. I have wonderful memories of many enjoyable hours spent doing crafty things such as painting-on-velvet, baking “shrinky-dinks” and weaving pot holders out of knitted fabric strips. Those childhood endeavors led to a life filled with the love of making handmade items. As a young mother, I wanted to make a quilt for my newborn son, so I signed up for a class at the local library. That was in the mid 1980’s. I’ve been quilting non-stop since, and have never looked back! I joined the local quilting guild; over the next few years I signed up for just about every workshop the guild offered. I was lucky to begin my quilting journey by studying with nationally known quilters such as Roberta Horton, who taught me how to piece with plaids, and her sister, Mary Mashuta, from whom I learned to love stripes. Taking a workshop given by Ruth McDowell, I developed complex piecing skills; from instructors with styles as varied as Elly Sienkiewicz and Jane Sassaman, I learned to appliqué. Traveling to quilt shows and seminars, I was able to study with great artists such as Michael James, Harriet Hargrave, Emily Richardson, Hollis Chatelain, Cynthia Corbin and the great Nancy Crow. Those fabulous instructors opened my eyes to the artistic possibilities in the world of textile art. In 1995 I began to work in a local quilt shop (now closed) where I taught classes in free-motion machine quilting, couching by machine, free-motion machine embroidery, fusible appliqué, reverse appliqué, color/design, and even classes based on quilts from my own pattern line, Inventing Tradition, as well as many popular patterns and books. My pattern business began accidentally, as I tried to fill a void for quilt shop customers who complained that although there were plenty of patterns available for Christmas quilts, there were none that celebrated Jewish traditions such as Hannukah and Passover. 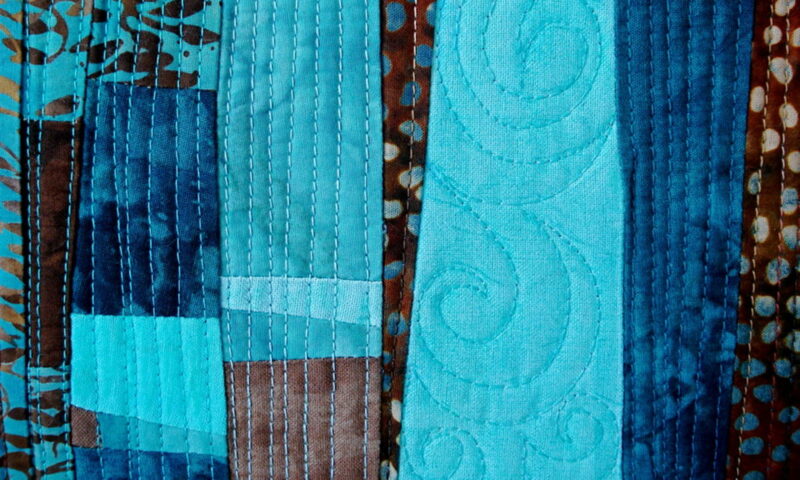 I designed a few such quilts and offered classes in the quilt shop. They proved popular, encouraging me to develop them into patterns. I marketed the patterns, selling them to quilt shops and distributors for a few years. In 2008, I sold the pattern company to 1-800-Dreidel, a Judaica distributor located in California. In 2005 I was invited to give a slide presentation to my own guild, and then branched out, traveling to other guilds in the New England and Mid-Atlantic region. I travelled to the Washington D.C. area to present my “Goddess Project” lecture and workshop for the Friendship Star Quilters. In 2008, during a trip to Venice, Italy, I was introduced to the lace made on the lagoon island of Burano. It was love at first sight, and when I returned from my trip, I just couldn’t stop thinking about it. In 2009, I travelled back to Venice for a three-week stay to learn from an expert how to make that beautiful, intricate lace, called “punto in aria.” Since then, the lace has influenced my work, leading to a new series of quilts called Venetian Lace. In this series I employ the use of both improvisational piecing and fused appliqué, along with a technique I call “free-motion-blanket-stitching.” Also new to this series is the use of hand-embroidered edgings. In January of 2015 I accepted a position as a manager and instructor at a local vacuum and sewing machine dealer. I created a quilt shop from “scratch,” designing the space, selecting the fabrics, notions, patterns and books to be sold, and teaching all of the quilting classes as well as giving private lessons and running events and sit and sews. After five years, I left the shop to open my own business. The Quilt Whisperer is my way of sharing my passion for quilting, and all the tips and tricks I’ve learned over the years. I love to teach. There’s nothing more exciting to me than that light that shines in someone’s eyes when s/he realizes that “s/he’s got it,” whether it’s someone new to quilting or someone who’s just discovered a new technique.